Santa Clara del Cobre, Mexico is a beautiful town located in the beautiful mountains of Michoacan, Mexico, close to the famous touristic area of Patzcuaro and its lake. Very close to a natural pristine water lake called Zirahuen. It is a small village whose main activity is copper manufacturing with artisan and handcrafted ancient techniques. It is within 4 hour driving distance from Guadalajara, Mexico. The town of Santa Clara is full of copper blacksmiths, a tradition inherited by the Spaniards and mixed with the old indian artisan techniques. Here, the copper hammering was first invented. Copper was originaly used to make cazos (pots and pans) to prepare local dishes. These cazos were sold all over the country as they are very popular in traditional and ethnic Mexican cuisine. A multitude of copper products have been produced throughout the years, being copper sinks the latest and most popular manufacturing products made in Santa Clara del Cobre. 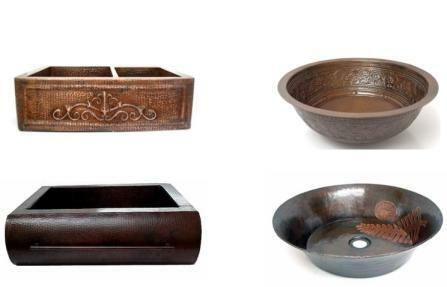 Copper sinks made in Santa Clara del Cobre, Mexico are recognized to have the best quality, beauty and craftmanship in the world.